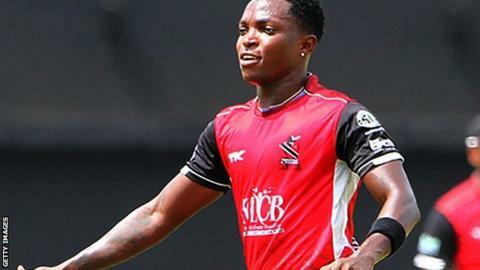 Fidel Edwards is set to join Hampshire earlier than planned after Australian paceman Jackson Bird has been ruled out for the foreseeable future. Bird, 28, is to fly home for treatment to his shoulder and neck, having signed to play for three months. He may yet return later in the season, but Edwards may arrive next week. "Fidel wasn't supposed to be coming in until later in the season, but we need that strike bowler with the new ball," said first-team coach Dale Benkenstein. "We don't know how long Jackson will be out yet, but if he does recover, he could play the last half of the season," he told BBC Radio Solent. "He's got a bulging disc in his neck, so it wasn't just the shoulder, which hadn't been picked up before." Fast bowler Edwards, 33, took 165 wickets in 55 Test matches for West Indies.